It was a Hotel Chocolat Easter egg I was given as a gift about 2 years ago that bought this chocolate company to my attention. At the beginning of the week Hotel Chocolat sent me anYour Eggsellency Easter Egg. (You can win one of your own Hotel Chocolat Easter egg here) The packaging it arrived in was so beautiful and enticing. I opened a black embossed box to find a large keyhole that led me to perfect silver foil-wrapped egg. 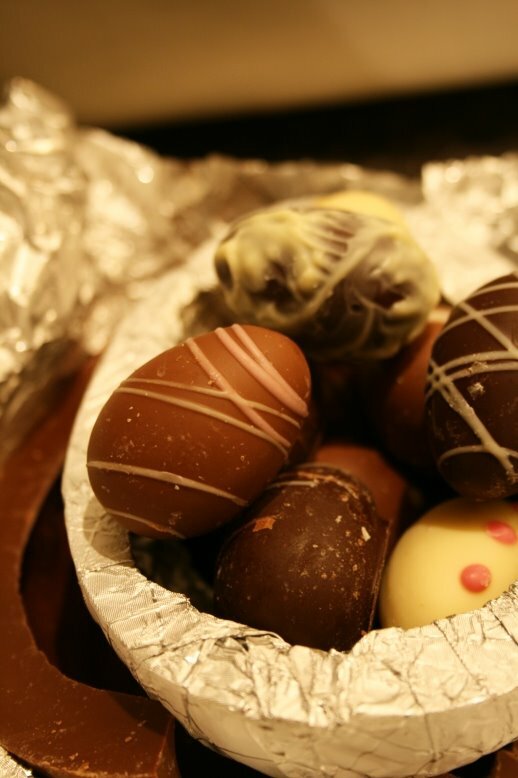 It sounds odd, but I think chocolate tastes better when it’s been wrapped in foil, just like KitKats did until they wrapped them in plastic…anyway slightly digressing there… Inside the two extra-thick eggshells were 10 truffle eggs. As I’m a huge lover of dark chocolate I was really pleased to see that half of the egg shell was 72% dark chocolate with the other half being 40% milk chocolate. The dark chocolate was beautiful not too bitter and with a hint of orange. The milk chocolate shell was incredibly smooth, not too sweet with the subtle taste of caramel. The truffles came in 10 mouthwatering flavours including Bellini, Amaretto, Whisky and Calvados. My personal favourite was Pink Marc de Champagne that reminds me of Hotel Chocolat’s delicious strawberries and cream chocolate that appeared in one of their tasting selections a few months back. Hotel Chocolat haven’t let me down with this Easter selection and anyone who loves their chocolate would love to receive this for Easter.